July 1, 1916 – November 18, 1916L The battle of the Somme fought in Northern France, was one of the bloodiest of World War One – in total there were one million casualties. The war of 1914 – 1918 claimed the lives of thirty men from Adderbury. Each of these men is being commemorated throughout 2014 – 2018 by the bellringers of St. Mary’s Church by ringing a Quarter Peal on the centenary of each death. Of these thirty men, four were known to be members of Charlie Coleman’s Edwardian boys Morris side. The first of the Morris dancers to be lost was Private Percy Wallace Pargeter of the Oxfordshire and Buckinghamshire Light Infantry 60 Brigade, who was killed in action on 7 October 1916 during the Battle of Transloy Ridges on the Somme. The pouring rain turned the battlefield into a barely negotiable morass. He was 20, and given the battle conditions it’s no surprise that his body was never recovered. The Adderbury Village Morris Men honoured these four men, none of them having a known grave, by visiting their memorials in 2008, the 90th anniversary of the ending of WW1. Percy’s name is engraved on pier 10 of the Thiepval Memorial. He was the son of Harry and Sarah Pargeter, Mill House, Adderbury. We are again paying tribute to these past dancers by adding our own ceremony to the occasion of the bellringing. 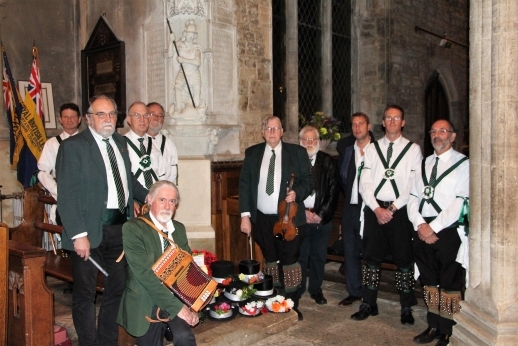 The Quarter Peal was being rung at 6:30pm on Friday 7 October 2016, so we gathered at the lych-gate in Morris kit at 7pm while the ringing was still in progress, to remember Percy Pargeter killed 100 years ago. The sound of the half-muffled bells was a sombre accompaniment to our pause in the churchyard while Edd Frost planted a poppy cross in the Garden of Remembrance. Moving into church we then performed a modified repeat of the ceremony we held at Thiepval. The proceedings were led by the Squire, who is indebted to Bryan Sheppard for the use of the text from 2008. Jim Plester read a poem The Soldier by Rupert Brooke. The wreath provided by Edd was laid by Chris Holmes below the war memorial in the South wall, followed by a pause for silent remembrance. Donald sang his own composition Never Dance Again, we all joining in the chorus. Chris Garrett read a poem For the Fallen by Laurence Binyon. The ceremony concluded with a celebration of the return of the Morris to the village through the efforts of Bryan Sheppard and Jim Plester amongst others, by us all singing The Happy Man. By this time the bellringers had come down from the tower to observe our tribute. Spirits were then lifted by a performance of the Shepherd’s Hey double jig. This was preceded by the music once through on the instrument of the Trenches, the harmonica played by the Squire. The main musicians, Donald, Jim and Malcolm took over for the dance by Chris Holmes and Edd Frost. Men present were Edd Frost, Chris Garrett, Chris Holmes, Pete Jordon, Donald McCombie, Jim Plester, David Reed, David Snell, Malcolm Wood and John Wright. Also in attendance were Mesdames Garrett, Jordon and Plester. It was lovely to have the support of the ladies as we did in France and Belgium in 2008. It being well after dark and no street dancing possible a few of us repaired to the Coach & Horses for a drink and a natter.